Professor Pavel Kazantsev is an enthusiastic teacher of solar and sustainable architecture at the Far Eastern Federal University (FEFU) in Vladivostok, Russia. He encourages his students during the 3-year course on the Fundamentals of Sustainable Architecture to create eco-friendly designs for residential and commercial buildings. The photo above shows the FEFU campus model created by Natalia Bakaeva; several other design studies are presented in the document attached to this news article. The first course was offered 25 years ago, in 1992, at the Far Eastern National Technical University, which became part of FEFU in 2011. Education on sustainable architecture must factor in a region’s distinctiveness is the paper’s main message. According to Professor Kazantsev, the Primorye region around Vladivostok is suitable for passive and active solar space heating. Thanks to the lower latitude and monsoon-like winters, temperatures are milder than those in the European part of Russia. Solar irradiation is 1,100 kWh/m² in the north of the region, 1,300 kWh/m² in the south and above 1,500 kWh/m² in the west. Sunlight hours add up to 1,900 to 2,500 a year, with most sunny days during the cold season. The development of project designs is accompanied by as many field trips as possible. 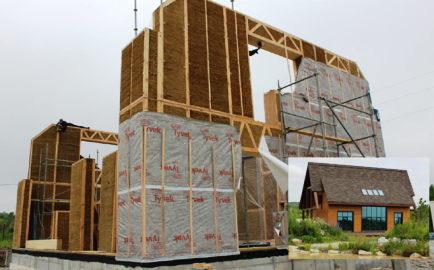 One of the trips usually leads to a single-family building made of wood and straw panels (see the photo below). Kazantsev supervised the construction of this low-energy building between 2014 and 2015. It has a living space of 134 m² and selective low-E triple-pane windows. The objective of this joint project of Russian architects and Lithuanian-based Ecococon, the supplier of the straw panels, was to measure the temperature inside the uninhabited structure without an added heat source during winter to analyse passive solar gains and the efficiency of the well-insulated walls. The judges of the Austrian Energy Globe Award recognised the pioneering work in eco-friendly residential building by awarding the project the National Energy Globe Award Russia in 2016. The efficiency of the passive construction based on traditional solar house architecture turned out to be satisfactory. During the monitoring period between December 2015 and March 2016, the temperature in the living space (first and second floor) was around 0 °С. It was going down slowly from +9 °С on December 20 to below zero on January 9 after a two-day snowstorm. Daytime temperatures below freezing point were only recorded on 6 of the 92 days. Residential design created by Alexander Kalmykov during the Bachelor´s programme. Studying the interaction between architecture and monsoon winds across ridge-hill land formations to plan new residential neighbourhoods in urban areas has remained an important part of the architecture course over the years and has resulted in many design studies. 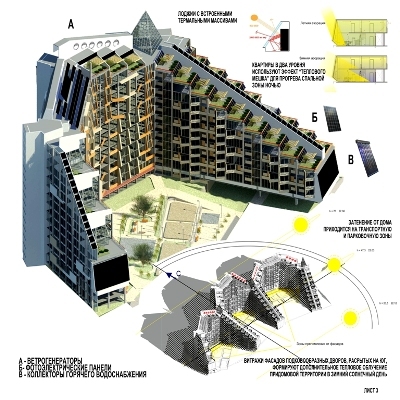 The traditional Vladivostok blocks of flats require a new vision – for example, in the form of a horseshoe shape, open to the sun and opposite to the wind – to make living comfortable during winter and the first half of summer (see the image above).